WASHINGTON — After Tuesday’s midterm contests, the number of female veterans and younger veterans in Congress are rising but the overall number of veterans in Congress remains on a steady decline. In a contentious election which saw Democrats take over the House and Republicans add to their majority in the Senate, 77 veterans won elections across the country. Combined with 15 incumbent veterans in the Senate who did not face election, that guarantees at least 92 veterans will be part of the 116th session of Congress in January. As of Wednesday morning, 10 races involving veteran candidates were still undecided. If all of those veterans were to win — an unlikely scenario, given the unofficial results at press time — that would still only match the 102 veterans who were in office at the start of the 115th session. Bookmark this page for election night updates on all the races featuring veterans. Still, Veterans Campaign Executive Director Seth Lynn said he sees plenty of positives in Tuesday’s midterm results for veteran candidates. “We saw an uptick in the number of non-incumbent veterans who got major party nominations this cycle,” he said. “We had an uptick in the number of women veterans. And we have a huge cohort of incoming veterans now. Of the 77 election-night winners, 17 of them are new candidates. Lynn said that’s the biggest class of freshman veteran lawmakers since 2010. Almost half of the veterans in Congress in January will be individuals who served after Sept. 11, 2001. Of the 92, 25 are Democrats and 67 are Republicans. Tuesday’s class of new veterans includes three Democratic female veterans. 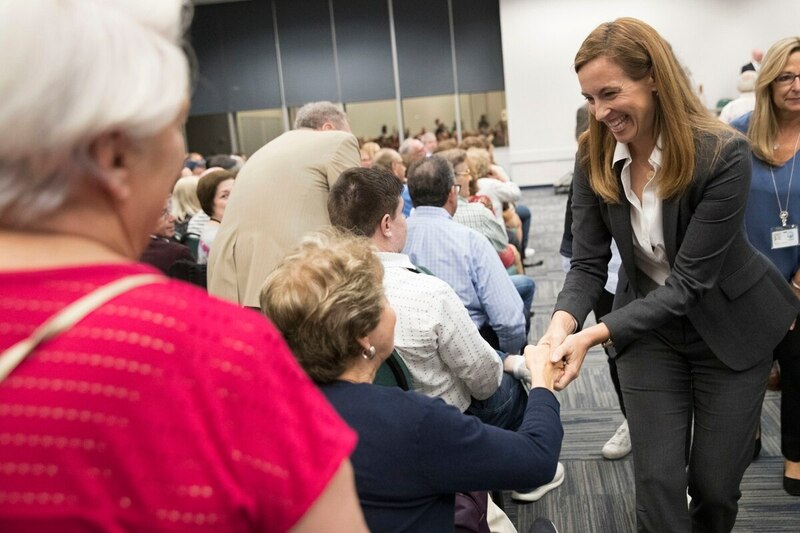 Mikie Sherrill, who won a New Jersey congressional seat, is a former Navy helicopter pilot. Chrissy Houlahan, who won in Pennsylvania, is an Air Force vet whose family boasts multiple military members. New Virginia Rep. Elaine Luria narrowly defeated fellow Navy veteran Rep. Scott Taylor in a key swing race for her party. They’ll join three incumbent female veterans — Democratic Hawaii Rep. Tulsi Gabbard, Democratic Illinois Sen. Tammy Duckworth, and Republican Sen. Joni Ernst — and possibly one other incumbent. Arizona Republican Rep. Martha McSally’s race for her state’s Senate seat remains too close to declare a victor. Democrats won the U.S. House in convincing fashion in Tuesday’s midterm elections, promising to shake up defense policy in the coming year and raising the possibility of tumultuous impeachment proceedings against President Donald Trump. The new class of veterans includes several names who have already drawn national attention. Texas Republican Dan Crenshaw, who lost an eye while serving in Afghanistan, was lampooned last weekend on “Saturday Night Live” for his injury, prompting an outpouring of conservative anger against the comedy show. He had been leading in the polls prior to the controversy, but now enjoys even larger name recognition as he heads to Congress. New Florida Republican Rep. Michael Waltz is a green beret and commentator for Fox News. Colorado Democratic Rep. Jason Crow, a prominent speaker at the party’s 2012 national convention, upset fellow Army veteran Mike Coffman, an incumbent representative. The total number of veterans in Congress has been on a steady decline since the 1970s, when nearly three-fourths of lawmakers had served in the military. Lynn said he is optimistic that Tuesday’s results show that decline isn’t guaranteed to persist, even if the number did not increase this cycle. But he also said a return to the previous highs of past decades is unlikely, given the much smaller percentage of veterans in America since the start of the all-volunteer Army.